Police say Russian journalist Arkady Babchenko was shot dead Tuesday at his home in Kiev, Ukraine. He can be seen here in 2013. A Russian journalist who was reportedly shot dead in his apartment in the Ukrainian capital on Tuesday arrived at a press conference 24 hours later, sound and healthy. 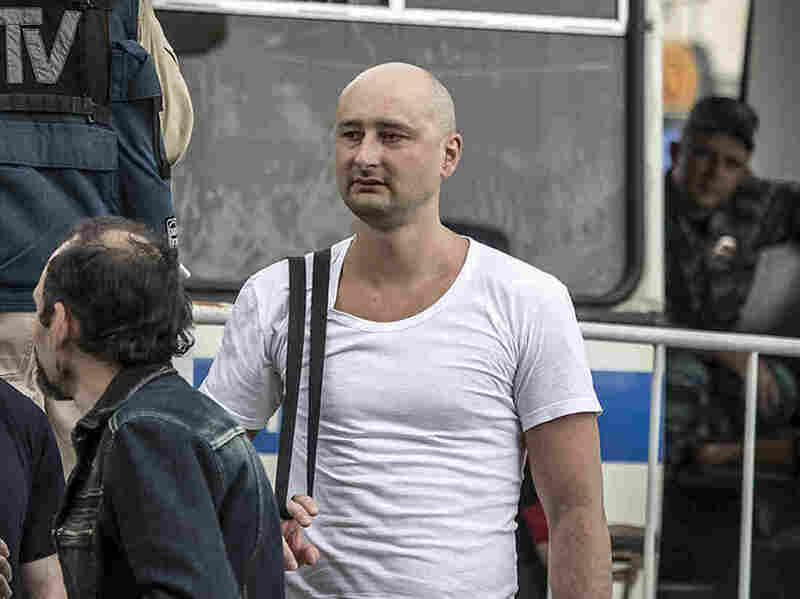 "I'm still alive," said Arkady Babchenko on Wednesday, apologizing to friends and family who thought he was dead. The Ukrainian security service said he faked his death to wipe out people who wanted to kill him. Russian journalist Arkady Babchenko was shot dead on Tuesday in the Ukrainian capital. Police in Kiev told news agencies that he was obviously targeted for his work. Kiev Post reports that Babchenko was shot in the back: "His wife was in the bathroom when she heard the shots and came in to find her husband wounded on the floor." She called the police Journalist died on the way to the hospital. " Babtschenko, 41, was a well-known war correspondent in Russia, but was fled in February 2017 from fear of his safety. He moved to Kiev in the fall, where a program on a Crimean Tatar television network took place, reports the Associated Press. "Then the tabloid LifeNews has collaborated with the courts to pay me a fine for not buying a bus ticket – I'm a war veteran, and enjoy the free public transport as a result. Fines are a well-known tactic in Russia that has been widely adopted to prevent anyone from leaving the country because of their debts. "Then came an online game in which players are challenged to deal with the enemies of their homeland with their own fists and boots." These enemies must be beaten until they fall. I'm one of them. " Ukrainian lawmaker Anton Gerashchenko wrote on Facebook that the investigators would investigate the efforts of the Russian espionage agencies to get rid of those trying to tell the truth about what is happening in Russia and Ukraine goes, "reports the AP. Babchenko is the second journalist who was killed in Kiev in the last two years. In July, investigative reporter Pavel Sheremet was killed by a bomb in his car. His case was not solved. And in March 2017, former Russian parliamentarian Denis Voronenkov, who had criticized President Vladimir Putin's government, was shot twice on a sidewalk on a busy street in Kiev. Ukrainian President Petro Poroshenko said the murder was "an act of state terrorism on the part of Russia."